James Barefoot, associate superintendent of the Alaska Conference, travelled more than 1,500 miles to visit villages. 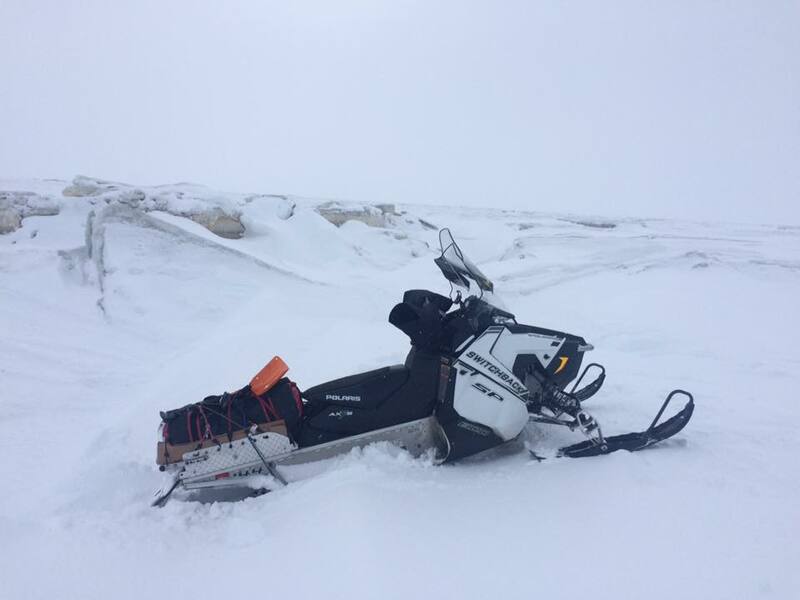 ANCHORAGE, AK (April 9, 2019) – James Barefoot was traveling about 30 miles per hour on his snowmachine in whiteout conditions across the ocean saltwater ice. He never saw the protruding piece of ice—until his vehicle slammed into it. The incident occurred on a 1,100-mile trip during which he visited six villages—some multiple times—in February and March. 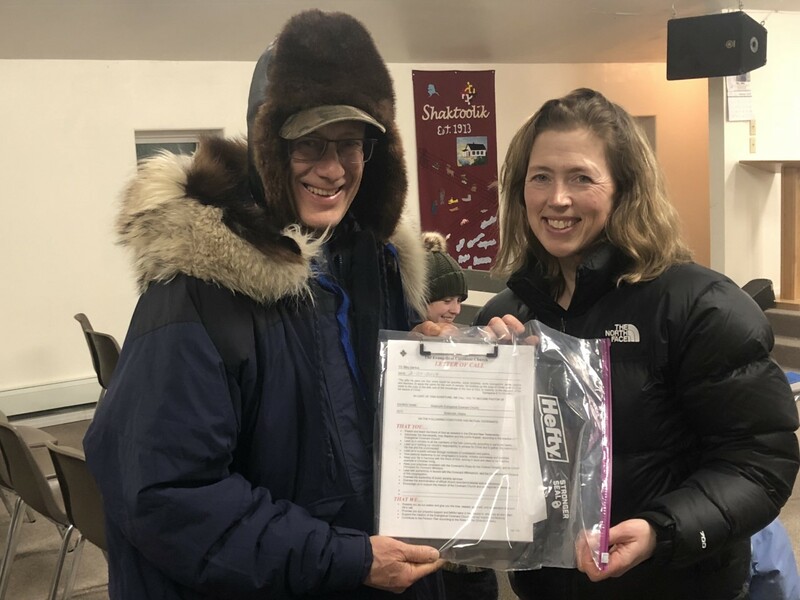 Included in those travels was a trip of nearly 600 miles to deliver Mary Gandee her official call letter, inviting her to serve the Shaktoolik Covenant Church in an Inupiaq village of 260 people. There were several days he rode 11 hours. “That’s a long day,” he says, laughing. Sometimes he wound up riding through water, so he made sure to pack the letter in an extra-large Ziploc bag so that it wouldn’t get wet. 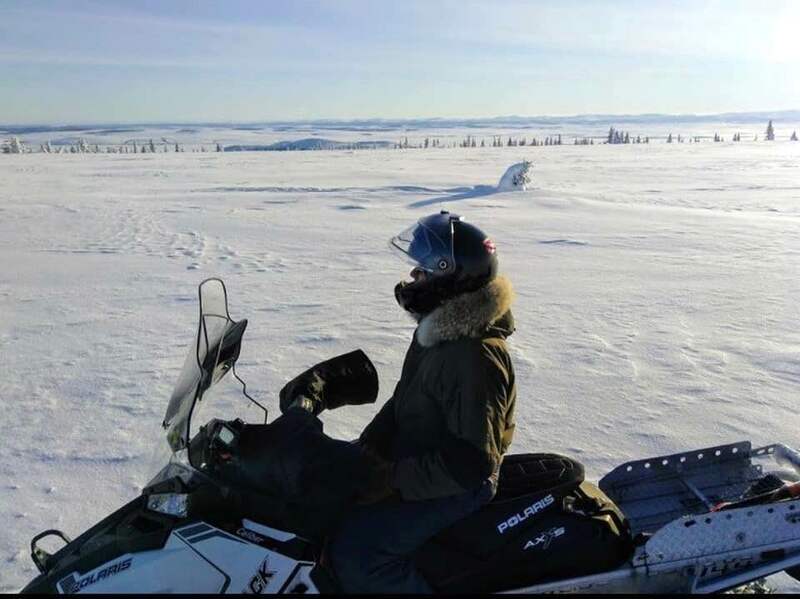 James Barefoot traveled 600 miles by snowmachine to deliver Mary Gandee’s call letter to be pastor of Shaktoolik Covenant Church. "Polly" had to have her windshield repaired temporarily with duct tape after the machine "kissed" a tree. Barefoot had to shovel out his snow machine at one point of his 1,100-mile journey. Barefoot says his accidents were no big deal. “Minor wrecks—such as being thrown from the machine— are common. You usually just land in soft snow. 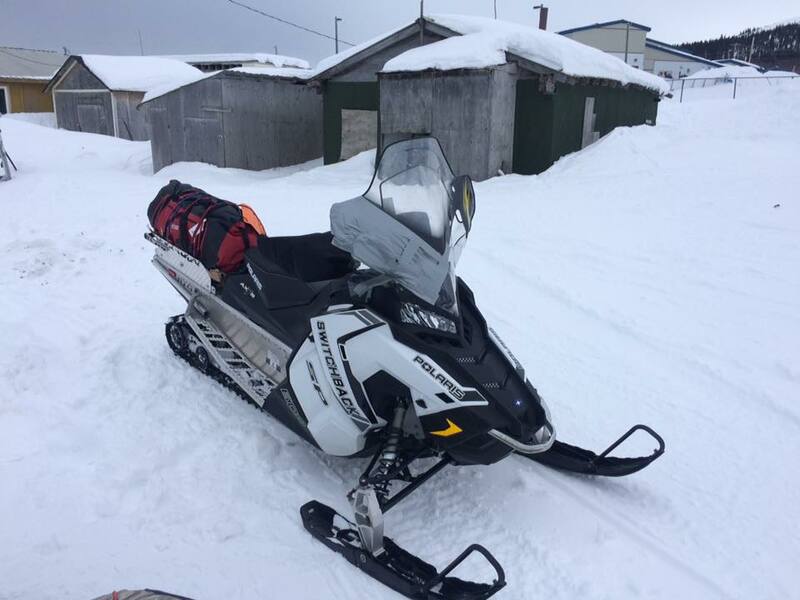 Riding a snowmachine between villages in Alaska is very rough riding, much like riding a dirt bike in the Lower 48.Although he says he is sore for days after returning home, a side benefit of these trips is that they keep him in good physical shape. “Getting a 600-pound machine unstuck in five feet of snow is a tremendous workout,” he says. Barefoot says the travel is important as he meets to encourage and discuss business with church leaders in the Alaska bush, where some churches don’t have pastors. When he visits those congregations, he often preaches and serves communion. On his most recent—and last trip—of the season, it rained for 150 of the 175 miles he traveled. “Very miserable!” he says. Still, for much of the time, “It’s incredibly beautiful out there,” Barefoot says. Barefoot has never been stranded in the wild, but he has had to change drive belts and spark plugs. If he ever were to encounter trouble, others would know about it quickly. A beacon sends a signal every 10 minutes and plots a point on Google Maps. The equipment can also enable him to send a text that he is OK. The beauty of Alaska is always inspiring for Barefoot. Climate change has reduced the number of months he is able to travel. He used to be able to start in December and ride into April. For the past five years, warmer weather has lengthened the routes he must take. He has been unable to travel over the Bering Sea between the Yukon area and Unalakleet because the ice was too thin. “In some places, the ice is completely gone,” he says. Still, traveling by snow machine is far more economical than by plane, which could cost upward of $100 between villages. Gas for the same trip might cost $36. Barefoot does more than offer advice and encouragement to pastors in the remote villages. He also makes basket sleds that he donates to the ministers. He has made eight so far. “It’s a very handy tool in the village,” he says. 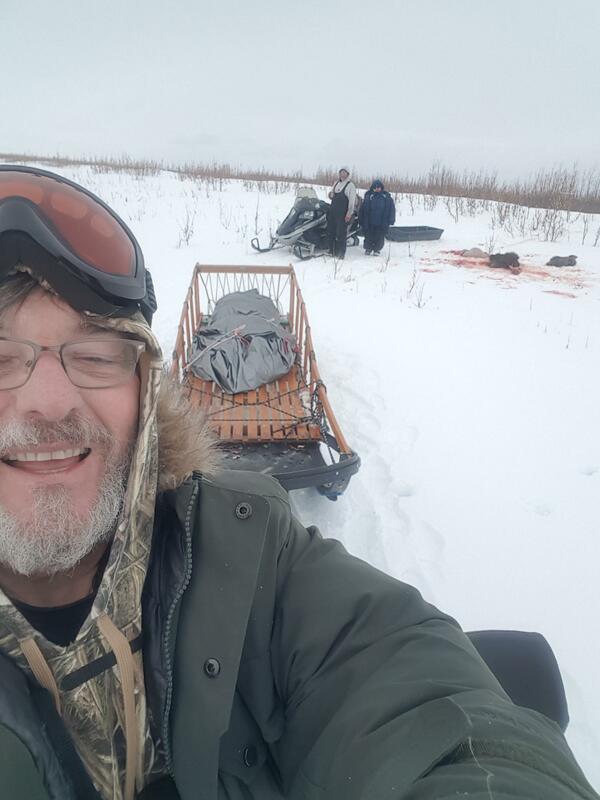 Marc Murchison, pastor of Mountain Village Covenant Church, has used his to haul a successfully hunted moose and transport people to another village for a special worship gathering. Some villagers use them to carry 33-gallon cans of drinking water retrieved from freshwater springs. 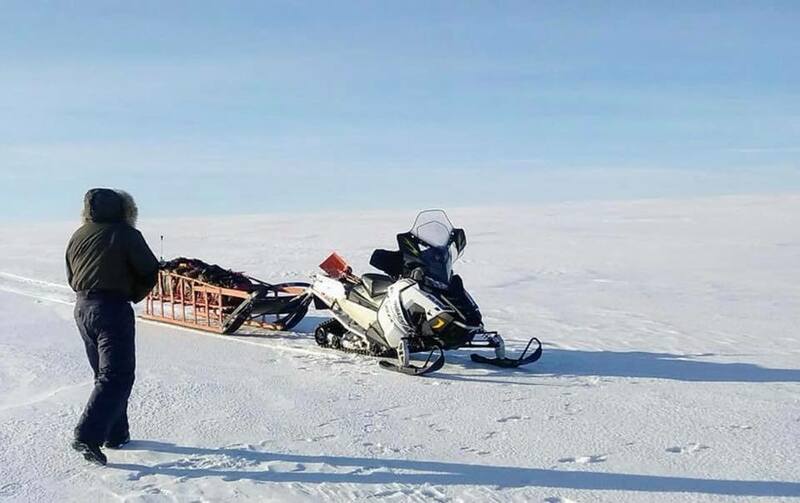 Marc Murchison, pastor of Mountain View Covenant Church, uses his sled when hunting for moose. 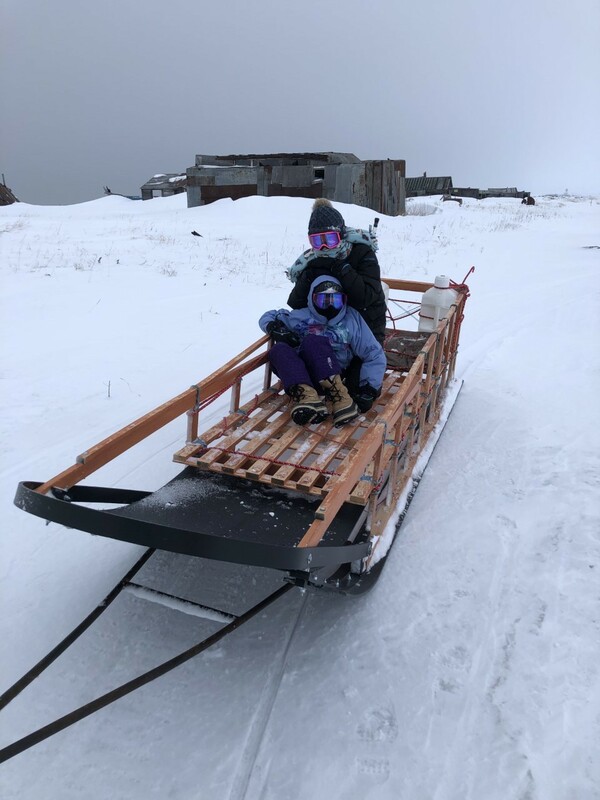 Mary Gandee's daughters, Payton and Marley, enjoy their new sled made by Barefoot. As the weather warms, he parks Polly and visits churches by air. That’s not always easy, either. He wrote on a Facebook post on Tuesday about his trip to Mountain Village for the Alaska Conference Annual Meeting that started on Thursday. This brought back memories of my time working at KICY in Nome, AK in the 1980’s. I never had any close encounters on a snow machine with trees, but ice ridges can send you flying, too. Air flight can also be adventurous. My visits to White Mountain, Mountain Village, and many to Shaktoolik are some of my best memories of those years! I’ve had the honor of serving alongside this man of God for over four years. James is an inspiration, a mentor, and someone I’m fortunate to call friend.